The non-wood bio-based products obtained from forests that can be used for pharmaceutical, chemistry, food and cultural purposes, are defined as non-wood forest products (NWFPs). NWFPs are derived from nature that decreases the consumption of the forests and protects the biodiversity using the sustainable utilization. The increased knowledge and awareness on forests, their functions, sustainability, industrial ecology, green production, green chemistry and the novel bio-products developed using cutting-edge technologies accelerated development of innovative NWFPs that make a significant local and regional economic contribution. Bursa, known for its widely available forest resources, is a key city located in Marmara Region in Turkey. It has a huge economic potential with the endemic NWFPs that host, the innovative manufacturing processes convert NWFPs to unique final products and the available industry partners capable of large-scale productions. Bursa Technical University Faculty of Forestry has successfully organized many organizations including but not limited to; Linden Tree Workshop, Stone Pine Workshop, Forest building, Transportation and Technologies Symposium, Resin Workshop, Forest Roads Standards Workshop and made a significant contribution to Turkish Forestry and related disciplines. International Non-Wood Forest Products Symposiums are symposiums aiming to bring the community together who works in the fields of "forest - medical and aromatic plants - nonwood products". Previous symposiums with the same topic have been successfully performed in Trabzon (2006), Isparta (2011) and Kahramanmaraş (2014), respectively. 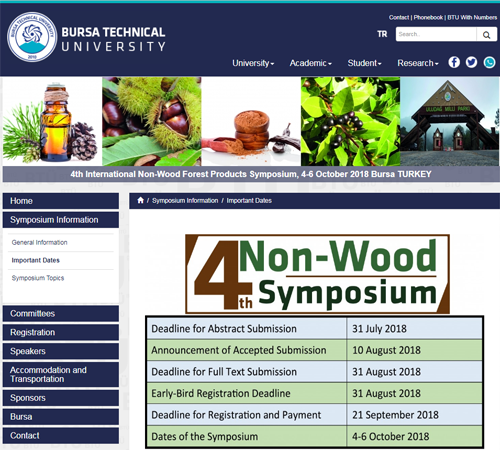 More information about this symposium (important dates, topics, registration & accommodation) at Bursa Technical University website.